The Plaide Palette started business in 1991, and has been on the internet since 1996. 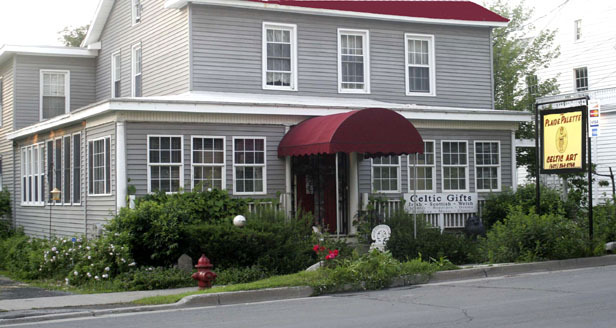 We are a family owned and operated business in scenic, central New York, specializing in the retail sales of Celtic gifts and teas. The retail shop, mail order and web business are located within the historic Oliver Judd homestead on Main Street in close proximity to many wonderful attractions. Ceramicist and tartan artist Susan Miller, her husband, Everett, and their children create the sculptures, jewelry, tartan painting and those “one of a kind” Wedding Cake Toppers on premise. In addition to the creative gifts prepared by the Plaide Palette people, they also import many fine gifts, teas and food from Ireland, Scotland, England and Wales. We also utilize local expertise in the fields of knitting, jewelry and quilting. One can browse the shop and enjoy the fresh country air and quaintness of this historic village “lost in time”. A visit to Cherry Valley – – – it’s like visiting “Brigadoon”. During the spring and summer months, the Plaide Palette takes its products “on the road”. We are an active participant in many Scottish Games, Irish Festivals, wine tastings and psychic fairs throughout the region. Stop by the shop or go on line to get our schedule. Our annual Christmas Open House is always the first Saturday and Sunday in December. Stop by for some holiday cheer.